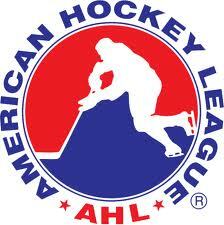 The AHL heads into the All-Star break just as several playoff races are starting to heat up. Furthermore, many NHL teams are sending down players sure to give some minor league clubs a boost during the Olympic break, which could have an effect on the rankings these next two weeks. For now, check out where your favorite team stands before AHL action resumes on Friday. Goalie Mike McKenna posted his third shutout of the season in Tuesday’s 3-0 win over the Albany Devils, making 25 saves. The Falcons also got a strong performance from Dalton Prout, who had three points in Saturday’s wild 6-5 overtime win against the Syracuse Crunch. 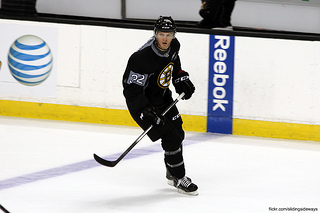 Springfield’s only blemish this week was a 3-1 loss to the Providence Bruins on Sunday. The Heat are still in the top five of this week’s rankings after going 3-1 in four games. 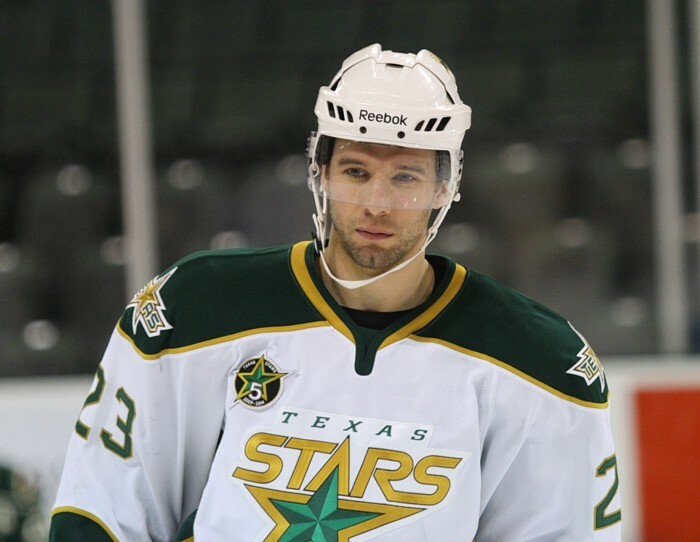 They suffered a tough 7-2 loss at the hands of the Texas Stars on Sunday, but on Wednesday, Brett Olson had three points as Abbotsford beat the Charlotte Checkers 4-3. Sunday’s loss ended the Heat’s five-game winning streak, but they still have the AHL’s best winning percentage at .660. After scoring one goal in two games last weekend, the Penguins had a strong showing at home with wins over the Portland Pirates and Adirondack Phantoms. Andrew Ebbett, in his first game back with Wilkes-Barre/Scranton after being in Pittsburgh, had three points in Friday’s 5-1 win. 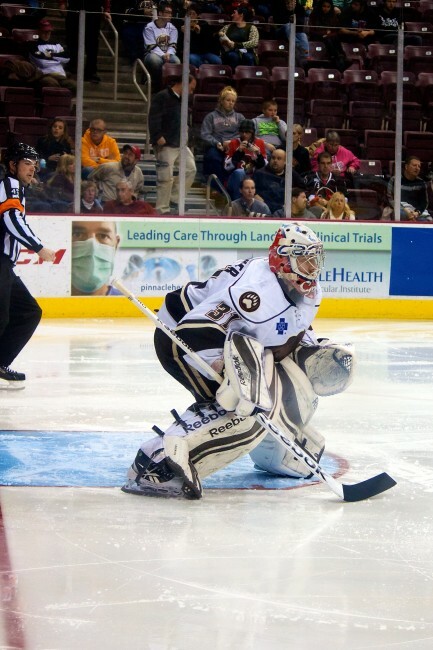 However, the Pens still cannot solve archrivals the Hershey Bears and lost 4-3 in overtime on Sunday. The Bruins have won three of their last five games, but are .500 in their last 10. They are tied with the St. John’s IceCaps with 59 points in the Atlantic Division and a 3-1 showing this week moved them to sixth place in the Eastern Conference. Craig Cunningham leads Providence with 18 goals on the season, while Nick Johnson is first with 38 points. Jerry D’Amigo stood out as the Marlies went 2-1 this week, tallying six points over three games. 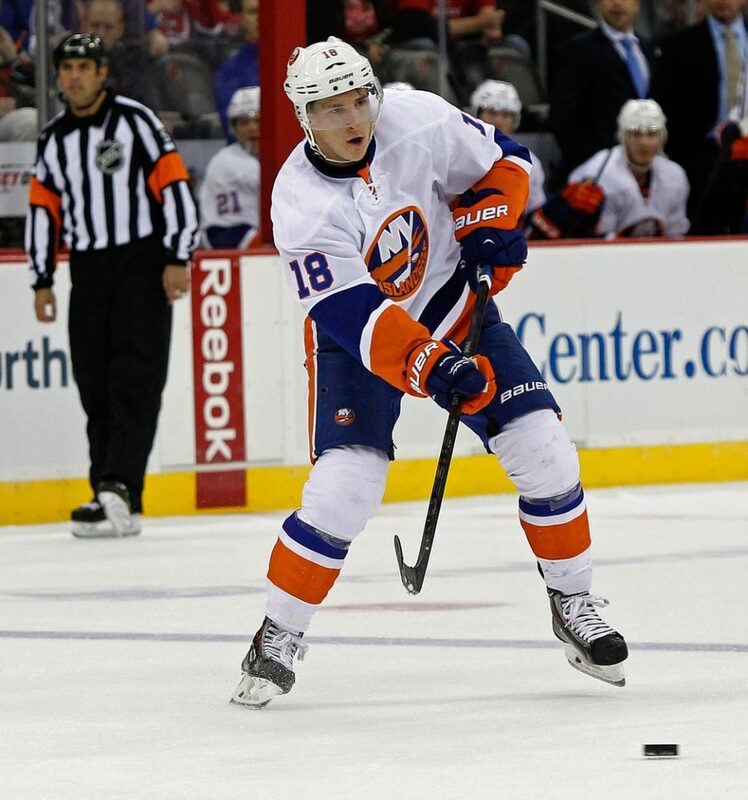 He has 17 points on the year and is tied for third on Toronto with 11 goals. The Marlies currently have a comfortable lead in the North Division, as they have 60 points and the Rochester Americans, the second-place team, sit at 52 points. St. John’s split two sets this weekend, taking one win and one loss apiece against the Bruins and Sharks. An 8-2 record in their last 10 games has moved them to fifth place in the Eastern Conference. Goalie Eddie Pasquale is tied for fourth in the AHL with 17 wins, and he also has a .920 save percentage and 2.43 GAA. The Wolves’ hot play continues, as they have won four of their last five games and are fifth in the always-competitive Western Conference. Ty Rattie gave Chicago a boost this week with three points in Tuesday’s 4-2 victory against the Utica Comets. He is the Wolves’ leading scorer with 18 goals and 30 points on the season. Rockford had a perfect week, going 3-0 and entering the All-Star break on a four-game winning streak. Jeremy Morin had four points in a huge 8-3 win over the Iowa Wild on Saturday, while Alex Broadhurst achieved the same in Sunday’s overtime win against the Comets. The IceHogs are currently in the West playoff picture with 54 points, but Rochester (52) and Iowa (49) are breathing down their necks. Manchester is on top of the East in spite of splitting its two games last week. Martin Jones made 19 saves on Sunday against Albany for his second shutout of the season and is currently 12-3-2 with a .932 save percentage and 2.02 GAA. The Monarchs’ top spot in the conference is nowhere near safe, as the Falcons are just two points back and have the league’s best winning percentage at .684. Grand Rapids had a tough week, going 1-2, and has lost three of its last five contests. However, the defending Calder Cup champs redeemed themselves with a 5-1 win over the Americans on Saturday. A five-game home swing awaits after the All-Star break, and the Griffins hope to keep fighting back on the heels of leading scorer Teemu Pulkkinen, who has 41 points this season. The Bears have not lost at the Giant Center since December 27, and their hot play in 2014 has helped them take seventh place in the East. Philipp Grubauer made 30 saves in a tight 2-1 win over the Pirates on Saturday, and he is one of the league’s best young goalies with a record of 9-5-1 to accompany a 2.23 GAA and .923 save percentage. The streaky Bulldogs are sitting at .500 on the season and are four points out of the last playoff spot in the West. Robert Mayer made 36 saves in a big 5-4 win over Eastern Conference contenders Binghamton on Saturday, and the Bulldogs ended the week with a 4-3 victory over Toronto. Saturday’s game marked the end of a five-game losing streak. Oklahoma City has won five games in a row and has averaged nearly six goals per game in that time frame. Roman Horak had a hat trick in Friday’s 8-5 win against Charlotte and added another goal in a 4-3 overtime victory in a rematch on Sunday. 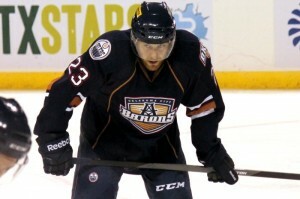 He has 24 points in 33 games since joining the Barons in early November. The Sens are 6-3-1 in their last 10 games, but failed to pick up a win this week. Their worst performance was a 5-1 loss to the Pirates on Wednesday. However, Binghamton is still leading WBS by one point in the East Division and is averaging 3.7 goals per game. Mike Hoffman is leading the way with 25 goals. Milwaukee picked up points in two of its three games this week, but is 4-6 overall in its last 10. Miika Salomaki recently took over the team scoring lead with 32 points on the season, but the Admirals are scoring just 2.7 goals per game this year. They are holding a playoff spot at sixth in the West, but will have to produce some offense and get a solid winning streak together to stay in the picture. The Devils are currently ninth in the East and on the outside looking in of the playoff picture. One bright spot is in the goaltending tandem of Keith Kinkaid and Scott Wedgewood, who combined for a 28-save shutout of the Sound Tigers on Saturday. Albany has not won more than two games in a row since the end of a six-game win streak in December, and it will need to re-establish consistency to reach the playoffs for the first time since 2010, when it was known as the River Rats. The Admrials split a weekend set with Hartford, and goalie John Gibson picked up his fourth shutout of the year when he made 25 saves in Friday’s 1-0 win. He has a 15-11-4 record along with a 2.38 GAA and .920 save percentage. However, the Ads are barely hanging on to the East’s eighth playoff spot, as they have 58 points to the Devils’ 57. Rochester’s offense struggled this week, as it managed just one goal in two of its three games. Luke Adam has 34 points for the unit that is averaging close to three goals per game, and the Americans could be getting a boost from Linus Omark, who will join the team after being waived by the Buffalo Sabres. Omark started the season with the Barons and had 29 points in as many games. Things are looking up for the Sharks lately, as they have gone .500 in their last 10 games and are eight points out of a playoff spot. They have also won three of their last four contests and have averaged over three goals in that stretch. However, the Sharks still need contributions from their whole team rather than relying too much on leading scorer Freddie Hamilton, who has 13 goals and 27 points. The Rampage went 2-0-1 this week and Joey Crabb picked up three points in four games to increase his total to 19 on the season. However, San Antonio may not have the talent to make the playoffs, and its annual February road trip is putting it against tough opponents such as Toronto and Grand Rapids. Although the Wolf Pack are still last in the East, they are slowly showing signs of improvement after winning two of their three games this week. Hartford is far out of the playoff race, but rookies Danny Kristo (team scoring leader with 31 points) and Jesper Fast (fifth with 18 points) provide hope for the future. The Wild ended a three-game losing streak on Friday by picking up a 4-3 overtime win against a hot Wolves team. They now sit in ninth in the West at 49 points and are three back of the last playoff spot. However, they are scoring just 2.5 goals per game. Carson McMillan (11 goals) and Brian Connelly (30 points) are the team’s offensive leaders. By heading to OT, the #IAWild collect a point, extending the point scoring streak to 10 games, an @TheAHL league high this season! The Comets goalies performed admirably this week. Joe Cannata had 43 saves in a 3-2 shootout win over Iowa on Wednesday, and Joacim Eriksson made 21 stops to shut out Milwaukee 3-1 on Friday. However, the Comets are still giving up three goals per game, and they are just looking to finish the regular season with their pride intact. Last year’s Eastern Conference champions are a shell of their former selves. Although they snapped a seven-game losing streak on Wednesday against Rochester, they dropped two games to the dominant Falcons over the weekend. One bright spot is Cedric Paquette, who is tied for eighth among AHL rookies with 31 points. The Monsters are 3-7 in their last 10 and only won one of their three contests this week. 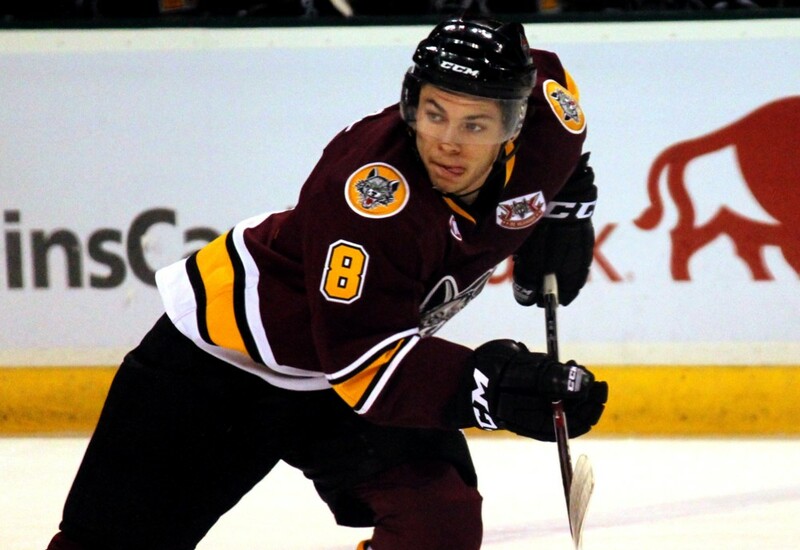 Andrew Agozzino had three assists and Sami Aittokallio had 19 saves in a 4-0 win against Grand Rapids on Wednesday. Agozzino is the Monsters’ leading scorer with 31 points this year. The Sound Tigers had wins in three of their last five games going into Sunday’s game against the Phantoms, and they added to their success by pulling out a 5-4 win. 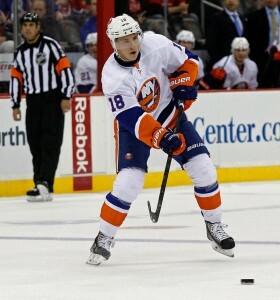 Ryan Strome and John Persson each tallied three points. However, at 45 points and in 12th in the East, they are a long shot at best to make the postseason. Portland has been in the AHL’s bottom heap all season, and with a 1-2 week and 2-8 record in their last 10, it is unlikely to recover from a slow start. Chris Brown stood out in Wednesday’s win over East Division leaders Binghamton with two goals. But on Friday, Coyotes goalie prospect Mark Visentin got shelled for four third-period goals against Wilkes-Barre/Scranton. The Checkers are close to .500 and have shown some momentum at times this season. However, they sit in 29th after a 0-3-1 week that included two losses against another the Barons, who also haven’t been a strong team this year. In Wednesday’s loss to Abbotsford, Brett Sutter (three assists) and Dan Biega (two goals) gave the Checkers some life in a close game. Adirondack falls out of favor after going 0-3 this past week and 2-8 in its last 10. The worst loss was a 4-1 defeat at the hands of the Wolf Pack on Tuesday. Despite this, the Phantoms still have a solid goalie in Cal Heeter, whose 2.49 GAA and .915 save percentage show that he just has an under-performing team in front of him.